The comparison of SOLAR-JET fuel with other alternative fuels and fossil kerosene with respect to life-cycle efficiency, CO2 emissions and yield requires a well-defined quantitative assessment framework. This framework defines metrics and methods, assumptions and information sources for calculating transparent, objective and reproducible figures of merit. This framework will allow a comparison of the SOLAR-JET performance indicators with the state of the art during the project to be made, to estimate the substitution potential of kerosene and to identify criticalities in the solar fuel production chain which need to be addressed in the project or in an R&D roadmap beyond the scope of SOLAR-JET. 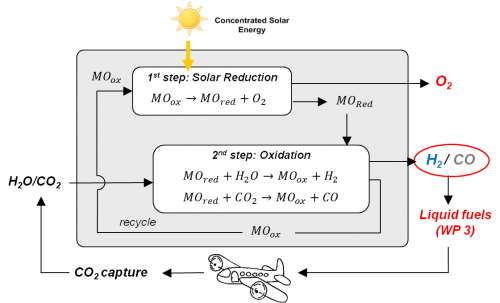 A solar chemical reactor will be designed and fabricated to realize the two-step solar thermochemical cycle based on non-stoichiometric ceria redox reactions for producing syngas from H2O and CO2. The design will incorporate results from the modeling of different geometries with coupled heat transfer and chemical reactions to achieve higher solar-to-fuel efficiencies and yields and specific CO/H2 syngas ratios. The technology gaps will be identified and addressed throughout the process. Within the scope of the project detailed modeling capabilities of heat transfer coupled with chemical reactions will be developed and tested. They will make able to investigate and optimize this new technology. Reliable predictions of key parameters such as reactor yield, overall efficiency and CO/H2 ratio will be verified. The numerical tools will be then used to investigate different reactor geometries and finding device scaling rules, a key parameter for the assessment of the technology potential and further needed technological improvements. The first “solar” aviation fuel will be produced. The close collaboration between units delivering the starting product (syngas) and those synthesizing the jet fuel (both are represented in this project) will allow adapting processes for achieving highest yield and efficiency. Moreover, technological gaps (e.g. using the Fischer-Tropsch process with solar-synthesized syngas) will be addressed. 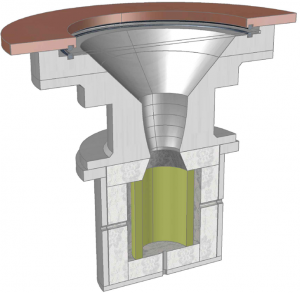 Experimentation will be performed for the non-optimized and the optimized solar chemical reactors in the high-flux solar simulator (HFSS) at ETH. The HFSS provides an external source of intense thermal radiation, mostly in the visible and IR spectra that closely approximates the heat transfer characteristics of highly concentrating solar systems, such as solar towers and dishes. Power heat fluxes are adjustable by the number of Xe arcs in operation, the position of the venetian shutter, and the position of the test target relative to the focal plane. This provides an ideal environment for experimentation under controlled, repeatable conditions. Various parameters will be identified and varied throughout the experimental campaigns to optimize efficiencies, yields, and CO/H2 ratios of the syngas. With the combined expertise of all partners, a high-level case analysis of SOLAR-JET, commensurate with the inherent uncertainty of turning scientific advancements into technological innovation and commercial success will be presented. The synthesizing work of the SOLAR-JET approach integrates the theoretical and experimental results into a clear and transparent representation of the potential impact on and advancements of future alternative fuel technology and economics for aviation. As a result, a better understanding of the technologies and economics of scaling up the SOLAR-JET fuel production, the R&D requirements and potential benefits and risks is obtained and a first roadmap for resolving the identified most important issues for implementation is presented.